Casa de Pico was selected by the La Mesa Award Program as an outstanding local business that serves the local market! Each year, the program identifies companies that have achieved exceptional marketing success in their local community and business category. These are local companies that enhance the positive image of small business through service to their customers and community. 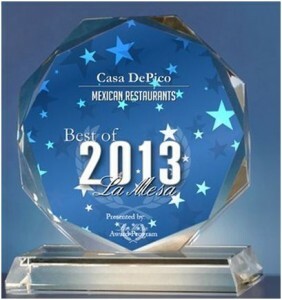 The La Mesa Award Program has chosen Casa De Pico for the 2013 La Mesa Awards in the Mexican Restaurants classification. 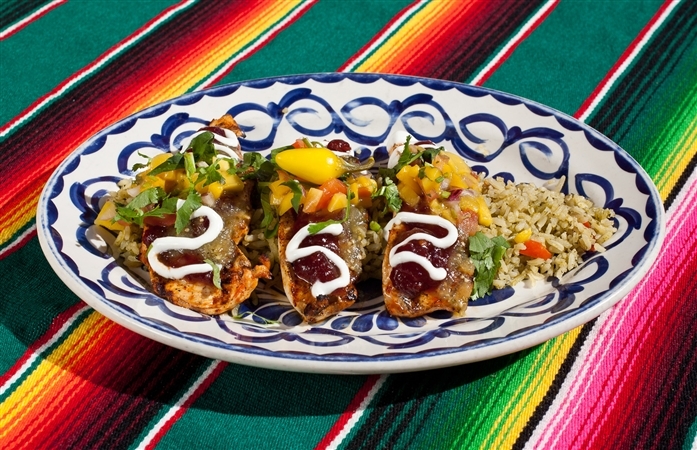 Healthy options can be few and far between when dining out – but not at Casa de Pico! Two of our favorite dishes off the Healthy Dining Menu were recently featured on Healthy Dining Finder. The Grilled Chicken and Avocado Tacos – two soft tacos served with pico de gallo and black beans – were recommended as Healthy Dining Options at Mexican Restaurants. Our Ensalada de Camerones – a fresh salad with grilled shrimp, avocado, gorgonzola cheese and tomatoes, tossed with a cilantro lime dressing – was also suggested as a way to enjoy healthy barbeque without creating a mess at home. Guests can feel good when eating with us. With several healthy and delicious selections traditional Mexican dishes, there is something for everyone at Casa de Pico.